Got IV Questions? Get Answers! Here are replies to questions I received either on twitter or FB. I thought I’d blog about it in the spirit of sharing and learning. There are literature supporting the use of nitroglycerin ointment for dilating veins prior to venipuncture both in adults and children. Most of the literature were prior to 2000 with the latest published in 2004. This article concluded that the application of epidermal nitroglycerine , especially when combined with a topical local anesthetics, can be recommended in infants and children. Its use in neonates and premature babies appears to be associated with higher rates of side effects. Haas, N. (2004). Vascular access for fluid infusion in children. Critical Care, 8(6), 478-484. Nitroglycerin venodilation: To dilate a small vein, apply nitroglycerin ointment to the site for one to two minutes as you make last preparations. Remove the ointment as you make your final disinfection of the site with alcohol. Used briefly, good vasodilatation occurs without significant systemic effect if fully removed, and without the hassle of using hot moist towels. There is no statement from Infusion Nurses Society’s “Infusion Nursing Standards of Practice” on the use of nitroglycerin ointment to promote vein dilation prior to venipuncture. Speaking from my experience, we did not routinely use nitroglycerine ointment but have used it in the past (like many moons ago). While it did work quickly as it only stayed on the patient’s skin for a few minutes, the patient however complained of headache after the venipuncture. As always, it is good to check your organization’s policies and procedures regarding this. Also, keep in mind there are other techniques to help dilate veins such as use of dry heat. Yes, the Infusion Nurses Society Standards of Practice states to avoid areas of flexion – antecubital areas (you already knew that), the wrist (cephalic vein) or veins in the palm side of the wrist. The radial nerve is located is located near the vein, causing excessive pain during insertion and potentially resulting in nerve damage. In addition, avoid affected extremity of a patient who had a CVA because of the extremity’s decreased or absent neurological sensation. Avoid catheter placement in arms of post mastectomy or axillary node removal. Avoid arms with fistulas or grafts. Avoid the vein of the lower extremities in the adult because of the increased risk of phlebitis. It is recommended to use the index finger (also called forefinger) since it is usually the most dextrous and sensitive finger of the hand . Here’s a tip I’ve written about vein palpation. 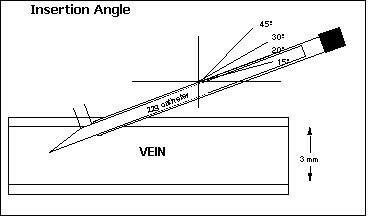 From a previous blog entry: Enter skin at an angle: Select the smallest gauge and shortest length catheter. Position catheter tip bevel up. Approach angle to skin at 10 –15 degree. Deeper veins need greater angle. Superficial require lesser angle. If parallel to the skin surface, will drag the skin as you puncture it. Lower angle once blood return is observed and advance the catheter. I’m looking forward to getting more…thank you for your Q’s and hope you find my A’s helpful!! ← B. Cereus…. contaminated alcohol swabs, pads & swabsticks? Anyone have a patient who was recieving subq continuous infusion and have slight bloody/white drainage under the dressing about 12 hours after needle inserted and infusion restarted? patient does develop raised red area beneath needle which takes about 5 days to resolve but does not always have same drainage. Help! Local site edema, discomfort, induration, erythema, leaking from the site, bleeding, and cellulitis are the potential complications seen in patients on continuous SC infusions. A lot depends on what is being infused and the volume. Most of the complications may be treated by rotating sites or limiting irritating medications. Is there any standard color codes available for Clinical Care Areas similar to those of drugs?